As we close the books on another National Planning Conference, let's take a look at the numbers and all the digital action that unfolded on social media. The official hashtag for this year's conference in New York City was #NPC17, and right out of the gates on Saturday, the hashtag began trending on Twitter, forecasting what ended up to be a busy and energizing digital conversation. From tweets to "grams," influencers to Snapchat filters, here's a rundown of stats and highlights across social media during #NPC17. Here are the accounts that had the most influence and most activity using #NPC17 on Twitter — or your "Power Tweeters"! Here's a snapshot of tweets around the globe during the busiest day of the conference on Twitter. And here are the accounts that had the most influence and most activity using #NPC17 on Instagram — or your "Gram Champs"! If you follow APA on Facebook, you may have noticed the live stream of the NPC17 opening keynote featuring Peter Leyden's address, "The Reinvention of America." Along with Leyden's talk, we heard remarks from APA President Cynthia Bowen, AICP; former APA President and current NYC Parks Commissioner, Mitchell Silver, FAICP; and a special APA Foundation Signature Cause announcement from Mary Kay Peck, FAICP. You can replay the entire opening keynote stream below. Follow APA on Facebook as we continue to post updates with conference blog coverage and get notified as we add to the NPC17 photo album. Watch Peter Leyden's Opening Keynote as well the announcement by Mary Kay Peck, FAICP, chair of the APA Foundation, of the Foundation's first Signature Cause on APA's YouTube channel. Want to learn more about the five 2017 APA National Planning Excellence Award recipients? Check out each recipient's profile video, debuted at NPC17 during Monday's Awards luncheon. 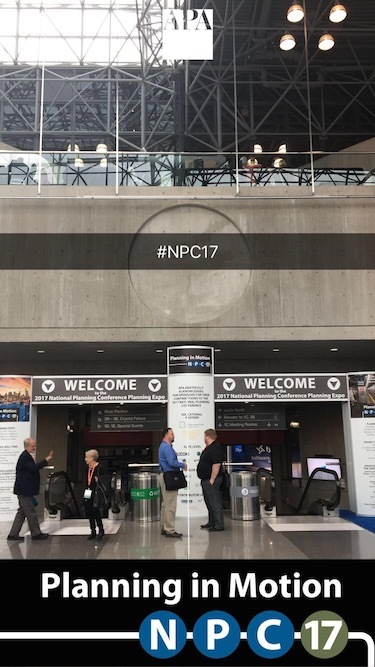 APA launched its first official Snapchat Geo-filter during NPC17 targeting the area around the Javits Center in NYC. The results are in, and the new conference-themed geo-filter boasted 702 impressions, 254 posts that used it, and almost 8.5 thousand total views. Top image: NPC17 attendees ride the escalator down to the Hudson Yards subway station. Photo by Joe Szurszewski. Michael Johnson is APA's digital commmunications senior manager.